3Doodler Pen Lets You Draw Objects In The Air, Destroys Kickstarter Goal | OhGizmo! We truly feel that this product is awesome. No… freaking awesome! 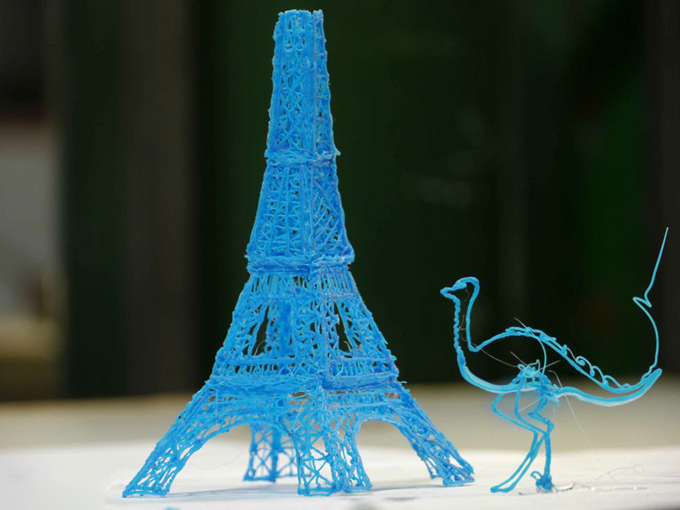 The 3Doodler is a special pen with which you can actually draw a 3D figure in the air. You can, as the company says, “lift your imagination off the page.” If you can wave your finger in the air to trace something, you can use the 3Doodler. At the press of a button, it melts and extrudes the same kind of plastic filament used in 3D printers, which hardens immediately, leaving a solid line of plastic which you can then connect to others you’ve already placed. Draw up, down, in circles… it doesn’t matter. The plastic is surprisingly solid once laid, and can support intricate designs. The kind of designs that result are very similar to that of wire artists, and in fact the company is partnering with successful Etsy wire artists to showcase what the device can do. If you think you won’t know how to use this, there are also stencils you can use to draw building blocks to more intricate structures, like the Eiffel tower pictured above. And the best part in all this? The cost: $75 gets you a pen, along with 2 bags of plastic. A bag contains ten 1ft. strands, which makes about 11ft. of filaments. Is it exciting? Yes, and the project has gone viral. Barely 24 hours old, they’ve blown past their $30,000 funding goal 33 times over as of this writing. But it’s still not too late to order yours with delivery in time for the Holidays.